The way smartphone manufacturer Motorola has rebounded from its not so better days is really commendable. It’s not only the way it rebounded, but also the way they have been able to improve their smartphones continuously is praise worthy. Recently, Motorola launched their new modular smartphone, Moto Z, which also is one of a kind smartphone. 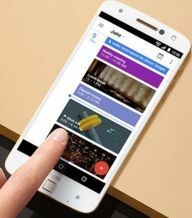 The company also claims the Moto Z as the world’s thinnest smartphone. Not only is the phone loaded with groundbreaking features, like the in-built projector, but the phone also has top of the line specs, too. So, let’s see in detail what this phone offers at the current price range. Talking about the external dimensions of the phone, it has physical dimensions as 6.04 x 2.96 x 0.20 inches, which makes it a rather hefty phone. However, the phone only weighs 136 grams, which makes it easy to carry by the users. Regarding the color variants of the phone, it comes in four color variants i.e. Black/Rose Gold, White, Black/Gray and Black/Gold. Talking about the display of this phone, the Moto Z features 5.5 inches AMOLED touchscreen display that provides a screen resolution of 1440 x 2560 pixels that roughly translates to 535 pixels-per-inch pixel density. The display can be easily said as one of the best parts of this smartphone. Not only the display seems to pop out of the screen, but the color saturation and brightness is also completely balanced. The phone is powered by a 2x2.15 GHz Kryo & 2x1.6 GHz Kryo Quad-core processor which is backed by a Qualcomm MSM8996 Snapdragon 820 chipset, thus, giving this phone beastly power. The processor seems to be competent enough to make sure users have a smooth lag-free experience. The smartphone offers 32/64 GB of internal memory, which could be expanded up to 256GB using the microSD card slot provided in the phone. The phone runs on Android platform and works on Android version 6.0 i.e. Marshmallow. To give the users a buttery experience the smartphone is provided with a 4GB RAM. The phone supports 4G/LTE networks, but only allows one SIM. The phone features a 13-MP primary camera that is supported by a dual-LED (dual tone) flashlight and a laser auto-focus. The front shooter sports a 5MP camera. Video recording can be done by the camera at frames like 2160p@30fps, 1080p@60fps. The images captured by the camera are noteworthy, and you would be impressed by the results. Overall, the camera works great and would serve well for the everyday purpose. Talking about multimedia, the phone like Apple iPhone 7, doesn’t feature a headphone jack. Instead, the phone features Type-C 1.0 reversible connector, in Motorola Moto Z which does allow users to use a headphone using a connector. 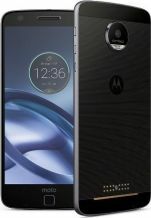 The phone allows a lot of mods to fit into it, and Motorola has partnered with JBL to give the ultimate sound experience through its Sound Boost mod. Not only the SoundBoost produces amazing sound, but it also packs an additional 2,200mAh of battery life. The battery provided in the smartphone is 2600mAh Li-Ion non-removable battery. However, the battery is a less of concern as there are tons of mods to increase the battery life. The phone supports fast charging. The smartphone also backs the basic functions, such as Wi-Fi 802.11 a/b/g/nac, dual-band, Wi-Fi Direct, Hotspot, Bluetooth version 2.1 with A2DP and LE, A-GPS, GLONASS, USG OTG (On the go) and a magnetic connector (to connect the mods). The phone also features a stylish fingerprint scanner, thus adding layer to the security of the phone.